Can a Greenhouse Be Certified Organic? Not only can a greenhouse farming operation be certified as organic but, in fact, organic greenhouse vegetable, herb and flower production is a regular and popular practice by certified organic farmers and market gardeners. In many cases, the greenhouse vegetable business is considered highly competitive. Nationally, the National Organic Program (NOP) offers certification standards and rules that organic farming operations must follow to achieve USDA organic certification. 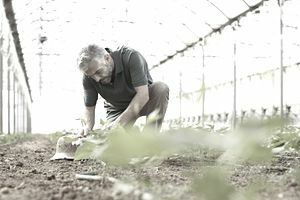 In most cases, running an organic greenhouse versus a conventional greenhouse varies very little in relation to greenhouse technology, but there are special considerations, such as pest control and fertility practices, to think about. For example, your soil must not have been treated with a prohibited substance for a minimum of three years. You can use artificial light, but you must use organic seed. If that’s not available, seed that hasn’t been treated in a prohibited way can be substituted. Of course, all your soil, fertilizer, and pest and disease control products must meet the strict organic standards. Does My Greenhouse Have to Be New? You don’t have to build an entirely new greenhouse to go organic. You can turn your existing structure into an organic operation, but you must follow strict guidelines. Your organic plants and soil material must not come into contact with any building materials that could jeopardize their organic status, such as wood treated with prohibited substances. You can also grow both organic and non-organic plants in the same greenhouse, but just like with outdoor crops, you can’t let the non-organic plants and growing materials contaminate the organic ones in any way. Protecting against contamination can include installing non-permeable walls that separate the two areas and a ventilation system that also prevents cross-contamination. How you grow and nourish your plants may make a difference in whether you can achieve organic certification. The NOP has formally recommended that greenhouse crops must be grown in soil to be considered organic. This means no hydroponics systems that nourish plants solely through nutrient-dense liquid solutions, and no aeroponics that nourish exposed roots through regular applications of nutrient-rich mist. There is a great deal of disagreement in the organic farming community over this definition, however, and some accredited certifying agencies have certified non-soil systems as organic. Because of this discrepancy, it is best to make sure that your system has a chance of approval from your certifying agency before you pour money into setting up a greenhouse hydroponics system. Find a local accredited organic certifying agent with whom you can discuss your needs. Create a stable organic system plan. Follow the rest of the USDA organic certification process with help from your agent.